The year 2003 rocked my world as a photographer. It wasn’t the year I purchased my first digital camera. This was the year Nikon introduced the SB-800, which was the first flash I could trigger off-camera using my D70’s popup flash. Using Nikon’s i-TTL technology, flash exposure was calculated using TTL (through-the-lens) metering just like a flash mounted to the camera. A few years later, Nikon introduced the SU-800, an optical wireless transmitter to control more speedlights at the touch of a button. Canon and other camera companies also introduced wireless flash transmitters—the days of cables were over. Today we are in another wireless flash revolution. Both speedlights and studio packs are incorporating highly advanced wireless features into professional-grade flash systems. Signal strength has improved, speedlights are more powerful, and high-speed sync is possible with many studio systems. Whether your studio is indoors or outdoors, wireless flash today opens new creative possibilities and simplifies photo shoots. Like many photographers, I first used cables to connect to my lights, but cables are like booby traps waiting to snap shut on a busy photographer. I’ve watched in horror as an expensive camera flies off a table in a studio when one of the crew accidently trips on the cable. No matter how many lights you have set up, wireless flash solves this potential disaster. One Elinchrom Ranger flash is used to illuminate a climber on the cliff. Triggered using the EL-Skyport Plus HS transmitter. Shows how cables are not practical in outdoor shoots. D810, 1/200, ƒ/6.3 ISO 31. Fort Collins, Colorado. Recently, I was photographing rock climbing using Elinchrom ELB 400 flash packs. I placed my lights on 24-foot stands near the cliff face to illuminate the climber. I rappelled from the top of the cliff to get into camera position. There was no practical way for me to reach my lights, but it didn’t matter. Using the Elinchrom EL-Skyport Transmitter Plus, I could more easily adjust each strobe’s output for the right exposure. Speedlights fill a specific niche in photographic lighting. Small, compact and powerful, these little lights are perfect for quick shooting situations and especially for portraits and travel photography. I rarely leave on a shoot without a few speedlights in my bag, and if weight is an issue, I may only use speedlights on the shoot. Speedlights today are incredibly advanced. I recently bought an SB-5000, Nikon’s newest speedlight. The SB-5000 is smaller and lighter than previous versions, more powerful, has faster recycling (with a built-in cooling system), a zoom range to 200mm and uses readily-available AA batteries. Canon’s 600EX-RT has similar features. Third-party flash systems are available for major camera brands, and the features on these flashes are improving as well. A behind-the-scenes shot showing the lighting setup. Photographer is hanging on a rope (tied in with climbing gear) to get the shot. Fort Collins, Colorado. But what makes both the Canon and Nikon flashes amazing is their wireless system. Instead of using an optical wireless signal requiring line of sight (as did previous Nikon flashes), these flashes use a radio signal, which improves range and doesn’t require line of sight. I have triggered an SB-5000 that was hidden behind a boulder nearly 70 feet away, which would have been impossible with an optical wireless system. A real challenge for optical wireless systems would have been the midday sun, but radio signals work flawlessly in these conditions. These modern flashes have receivers built into the flash; all you need is the transmitter. One thing I really like about the new Nikon radio transmitter (WR-R10) is its size. Nikon chose not to produce another hot shoe-mounted transmitter but instead created a very small transmitter that connects to the 10-pin terminal on the camera. With the WR-R10 attached, you can control the SB-5000 via a flash commander mode on the camera LCD. The back of a Nikon D500 showing the commander display mode used to control the SB-5000 in remote wireless mode. Sinks Canyon, Wyoming. This has two advantages. One, the WR-R10 is very small and unobtrusive; you don’t have another accessory mounted on the camera hot shoe. And two, the WR-R10 uses the camera battery for power instead of requiring a different set of batteries in the transmitter. Bring extra batteries for your camera, and your wireless transmitter is covered as well. Speedlight wireless technology doesn’t end with improved signal strength. The new radio transmitters also fully support numerous flash modes, including TTL and Manual. But even more important is using High Speed Sync (HSS) with my wireless transmitter. HSS allows me to shoot at high shutter speeds well beyond my camera’s normal sync speed. 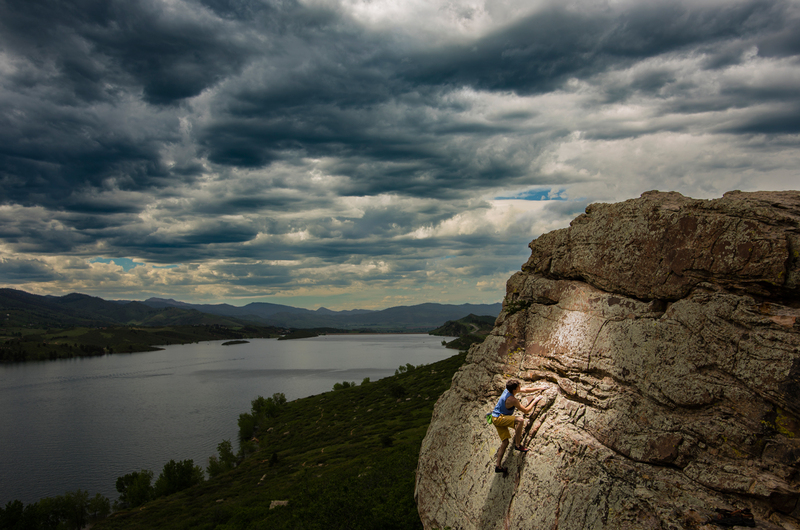 A rock climber illuminated using a Nikon SB-5000 off-camera and a D500. This shot illustrates the improved radio signal this new flash and transmitter (WR-R10) can achieve. D810, 1/250, ƒ/6.3. ISO 64. Sinks Canyon, Wyoming. Imagine this scenario. If I am shooting a portrait with flash in midday light, I often choose an aperture of F1.4 to create a soft, out-of-focus background. But I may need a shutter speed around 1/2000 to get the right exposure. Using HSS allows me to shoot at this fast shutter speed using my speedlight flash, and the fast shutter speeds can also help freeze the action—all controlled wirelessly at the camera. As advanced and convenient as speedlights are, there comes a time when you need more power. A top-end speedlight might have around 60 watts of power, compared to studio packs, which often start around 400 watts in power. In other words, one small studio pack is the equivalent of approximately seven speedlights. When you need more power, it makes sense to use larger strobe systems. Behind-the-scenes studio shot; shows clamshell lighting and uses the Lastolite HiLite background (mentioned in the five flash accessories section). Also illustrates how wireless eliminates cables in the studio. If you think wireless flash has revolutionized speedlights, you won’t believe what has happened to wireless studio strobe systems in recent years. Utilizing lighter and more powerful lithium-ion batteries, portable battery flash systems like the Elinchrom ELB 400 weigh around 4 pounds and have 425 watts of power. These lights have become my main light for many shoots. I’ve found 425 watts is enough power to overcome midday sun, and the packs can shoot 350 full-power flashes. Profoto’s B1 and B2 are another popular compact, powerful battery system using wireless transmitters. The B1 is 500 watts while the B2 is 250 watts. Many other companies have introduced new flash pack systems that are lighter, stronger…and wireless. A recent studio shoot of mine really summed up the advantages of today’s wireless systems. I was photographing a model in the studio, and as the shoot progressed we wound up using three different Elinchrom lights. I was shooting an 1100W/s Ranger battery flash through a huge octabank, an ELC Pro HD 1000 watt head as a fill light, and my ELB 400 as a background light. Using the EL-Skyport transmitter, I was able to trigger all the lights and control output on two of them. No cables, no need for anyone to run around and adjust power. I just sat on my stool and shot away, controlling the entire lighting setup using my wireless transmitter. Portrait created using one 74” octabank against white seamless background. D810, F8, 1/200. ISO 200. The Profoto B1 and B2 both offer TTL flash just like your speedlight. You basically set up the light, aim it at your subject, and take the shot. Using TTL metering, the exposure should be accurate, similar to using a speedlight in TTL mode. But unlike a speedlight, the B1 has 500 watts of power (the power of nine speedlights), enough to shoot through a large softbox in bright conditions with fast recycling times. The other game changer in portable studio flash has been the inclusion of high-speed sync. Some packs, like the Profoto B1/B2 and the Dynalite Baja B6, achieve high-speed sync similar to a speedlight. When HSS is being used, the flash goes into a lightning-fast strobic mode to illuminate the subject no matter how fast the shutter curtain is moving. You can shoot at shutter speeds up to 1/8000 using flash with these packs. Behind-the-scenes studio shot; this image shows using a ring flash with the HiLite background. Illustrates how wireless eliminates cables in the studio. Elinchrom uses a slightly different method to achieve Hi-Sync (its term for high-speed sync flash). Instead of a strobic burst, Elinchrom units like the ELB 400 and Ranger use one flash burst that is retimed to fire right before the initial flash burst. This retiming uses an optimal part of the flash burst to coincide with fast shutter speeds. Elinchrom took this even further and designed flash heads (Quadra HS head) with a slow flash duration to optimize Hi-Sync performance. The wireless flash revolution continues today. Compared to DSLRs, mirrorless cameras are way behind in their wireless flash capabilities, and manufacturers are taking notice. Phottix now makes a radio wireless flash (Mitros+) for the Sony A7 that is capable of both TTL and HSS. And it is only a matter of time before other brands improve their wireless flash options. Battery technology continues to advance; expect lighter, more powerful studio packs in the future. Wireless flash is here to stay. To get the most out of your wireless flash system, take a look at these five accessories that will transform your image making. Elinchrom Indirect Litemotiv Octa Softbox 75”. This light modifier and the earlier version became the industry standard for soft light. Why? Unlike most softboxes that position the flash facing forward, this octabank aims the flash back into the softbox, resulting in incredible, even, soft light. I have used the earlier 74” version as my main light on countless photo shoots. Brackets are available to use this light with other brands like Profoto. Lastolite Triflash shoe mount bracket. I often use multiple speedlights to increase power and reduce recycling times, and this bracket is the tool I use. You can mount up to three speedlights on the bracket and use the umbrella socket to attach an umbrella. ExpoImaging Rogue Flashbender. Another handy speedlight accessory, this simple white speedlight reflector attaches directly onto your flash to bounce light at your subject. Flashbenders have flexible rods, so I often bend mine into a snoot for a great accent light. Hoodman HoodLoupe. Nothing is more frustrating than photographing in midday sun and trying to review images on your camera LCD screen. I always seem to be looking for the darkest corner on every shoot to review images. The Hoodman HoodLoupe solves that problem. This black loupe eliminates outside light so you can review your images on the brightest beach in Miami. Lastolite HiLite Illuminated White Background. If you have ever shot a corporate headshot in a small office, you know how frustrating it is trying to light the background separate from your main light. This background system allows you to put lights in it and illuminate the background from inside. You can literally shoot a white seamless shot with your main light and subject only a few feet away from the background and still blow out the background independent of your main light. In the last few years a number of manufacturers have (finally) started producing battery-powered, TTL strobe systems. These systems work with the in-camera meeting to accurately control lighting output from flash units that are more powerful and more versatile than on-camera strobe. To see more of Tom Bol’s photography and learn about his workshop opportunities, visit his website at tombolphoto.com.